Say goodbye to a boring breakfast, because this Sausage and Pepper Egg Bake is positively packed with flavor! You’ll season your own sausage (it takes about a minute and it’s so much lighter and tastier) using ground turkey breast, top it with onions, chiles and jalapeno, two types of cheese and a seasoned egg mixture, and then bake – it’s really easy! This Sausage and Pepper Egg Bake is great to serve the family for breakfast or brunch or to make on Sunday and eat for breakfasts during the week. One serving is just 236 calories or 2 WW Freestyle SmartPoints and just 5 grams of carbs! 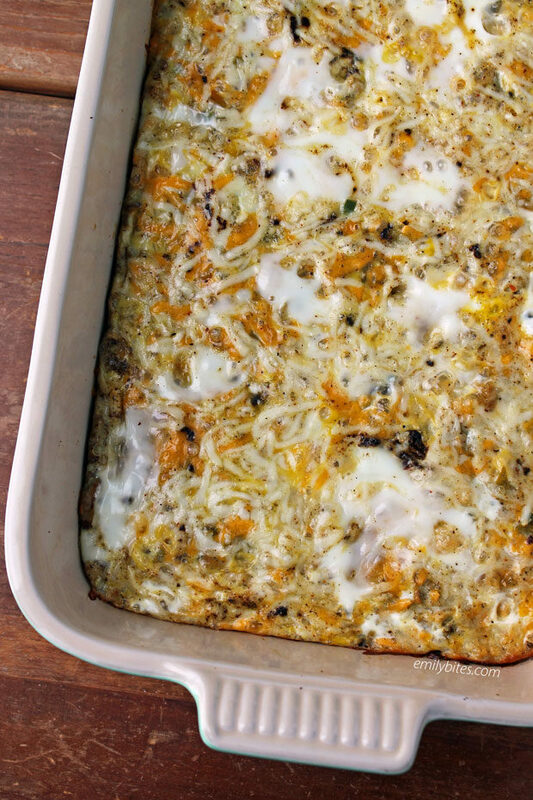 Looking for more flavorful lightened up breakfasts like my Sausage and Pepper Bake? Check out my Apple Cinnamon Pancakes, Ham and Cheese Hash Brown Quiche, Bacon Sausage Egg and Cheese Braid, Triple Berry Yogurt Bowl, Pear Gingerbread Baked Oatmeal Singles, Sausage Apple Cheddar Frittata, Berry French Toast Muffins, Ham and Cheese Egg Cups, Orange Cranberry Baked Oatmeal Singles, Apple Streusel French Toast Muffins, Butternut Squash Autumn Frittata, Bubble Up Breakfast Casserole, Blueberry Baked Oatmeal Singles, Sausage and Stuffing Brunch Bake, Mini Dutch Baby Pancakes, Pumpkin Chocolate Baked Oatmeal Singles, Sausage Egg and Cheese Hash Brown Cups, Banana Chocolate Baked Oatmeal Singles, and many more in the breakfast section of my recipe index! Preheat the oven to 375 degrees. Lightly mist a 9×13 casserole dish with cooking spray and set aside. In a mixing bowl, combine the ground turkey with 1 teaspoon salt, ½ teaspoon black pepper, the sage, thyme, marjoram and crushed red pepper. Stir (or mush with your hands or a fork) until the turkey is well combined with the seasonings. Mist a medium nonstick skillet with cooking spray and bring to medium heat. Add the seasoned turkey and cook, breaking up with a wooden spoon or spatula, until the turkey is cooked through and broken into small pieces. Remove the turkey sausage to the prepared casserole dish and spread across the bottom. Wipe out the skillet with a paper towel. Mist the skillet with cooking spray again and bring back to medium heat. Add the onion and jalapeno and cook for a few minutes until softened. Mix in the diced green chiles and stir together. Cook for another minute then remove from heat. Spread the onions and peppers over top of the sausage in the baking dish. Sprinkle the shredded cheese over top. In a large mixing bowl, combine the eggs, remaining ½ teaspoon of salt, ½ teaspoon of black pepper and the chili powder, cumin, and garlic powder. Beat the eggs and seasonings with a whisk. When beaten, pour the eggs over top of the cheese layer in the baking dish. Bake for 30 minutes or until a toothpick inserted into the center of the casserole comes out clean. Cool for 10 minutes and cut into 8 servings. If I decided to use turkey breakfast sausage, which spices would you leave out? All of the ones that go in with the ground turkey – that’s the sausage seasoning! Looks & sounds super yummy! Could I assemble this in the evening, and refrigerate it until I put it into the oven the next morning? I’m expecting overnight guests during the holidays, so preparing this dish beforehand would make it much easier in the morning. I haven’t done that, but I definitely think you could! Thanks Emily! I love your recipes! Do you think this would freeze well? I don’t freeze things so I can’t say for sure but I imagine that it would freeze well! Haha, I feel you on that! You could definitely sub some of the eggs for whites only, you may just want to add a few more whites. You could also probably use slightly less cheese if need be ;). Hi! Is this gluten free? This was INCREDIBLE! 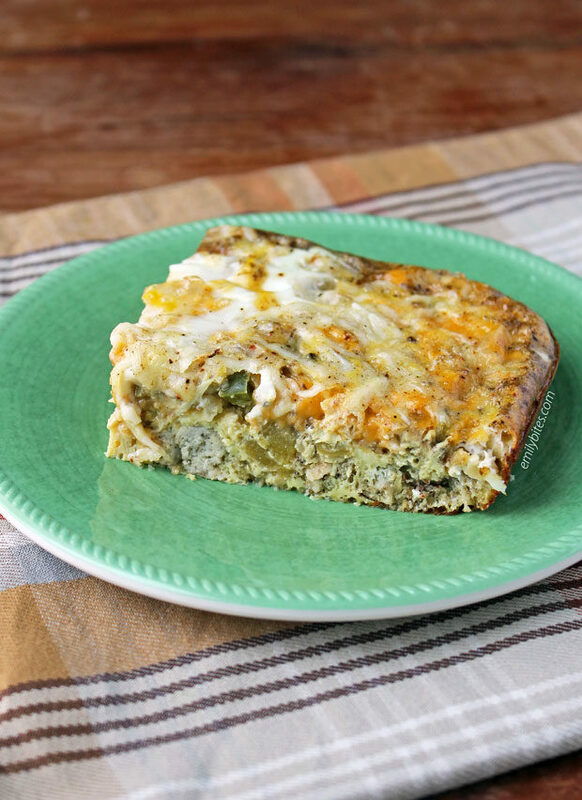 Best breakfast casserole I’ve made and my husband loved it too! Major win!